Opendoor Studio: Looking Forward ... Door County ! Sadly, this weekend I was unable to attend the Vintage Market held on the grounds of a favorite stop whenever I am in the Door. Viva La Cottage. This darling and beautifully decorated shop sits just north of Baileys harbor and south of Sister Bay, next to the Door County Bakery on Highway 57. They always put on a beautiful event and I am always surprised to see many friends who are showing at that little fest. It really has made a name for itself. Was named one of the best, small flea Markets in the Country by Flea Market Style Magazine! Maybe you caught it this weekend! I had to put my Vacation on hold so that I can take it in several weeks. 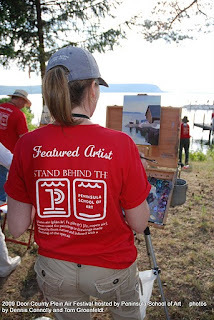 I will be heading to Door County, but to participate in the Door County Plein Air Festival. This fest is gaining greater notoriety from year to year. Last year I participated and was able to paint along side Ed Terpening, an accomplished pro and all around great gent! I painted Malibu Moo's Ice Creamery. I had a reason for doing so. I've found that over the years, while attending the fest, the paintings with landmarks seemed to sell for the most money. I believe people want a memory of time spent in the Door and for an affordable price. So, with that in mind, I set up my easel to paint on Saturday morning for the quick paint. The Dockside Quick Paint includes some 60 community members and other painters from all over the country. All gather at 8:00 am and at the sound of the horn, exactly at 9:00 everyone begins to paint. My weapon of choice was Oil. There were Watercolorists as well as folks working with pastels. The horn sounds and you have exactly 2 hours to complete your painting. When the horn sounds again, you have to put your paint brush down and have to check it in for a final review. 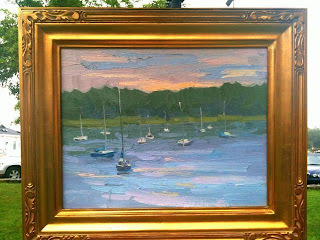 2009 dockside framed works, just completed! Shortly after the Dockside Paint Out at Sunset Park,Fish Creek... they have a lively auction of the professional's works. I love this! All of the folks who have gathered to watch the artists, have the opportunity to see the freshly painted pieces, still on the easels of the artists... all in one place, lined up in a row. So great! The past several years, the rain has come up from over the bay and they have had to move the auction indoors. Last year they relocated it into the little town hall just next door to the park. Paintings ranged for sale at auction, from $250 to thousands depending upon the subject and the artist! After the paint-off, there is some down time but the amateurs take their pieces to the Penninsula School of Art to set up for the night's activities. A wine and cheese event held on the beautifully blooming grounds of the school. Amateur artists ( such as myself) compete for a spot in the Fest the following year. There really are some talented artists in the competition. More and more, you will find many professionals who are vying for a spot in next years competition. Talent abounds here! I will be off and running Friday night July 22nd and will compete in this years paint-off Saturday morning. I hope to have a sale that night, Last year I sold my painting for $195.00. A nice percentage goes to the School of Art on behalf of the artist! Fantastic! So very talented. I am so jealous. @Whimzy Thyme...Thank you for your kind comments! I am so lucky to be able to persue my interests! Truely blessed... and I appreciate all you do for our team! Thank YOU!